Politics.be - Los bericht bekijken - SpaceX ---wat een firma! Discussie: SpaceX ---wat een firma! SpaceX will reduce its workforce by 10 percent. Statement below. Story later tonight. 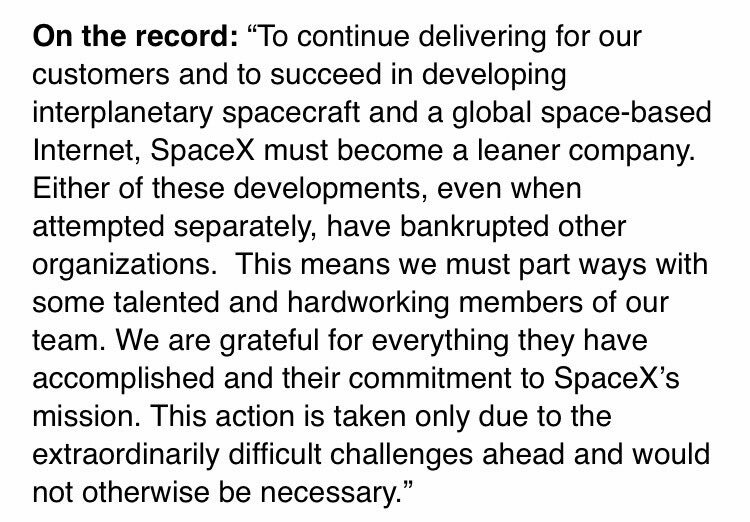 SpaceX will lay off up to 10 percent of its work force, the company said Friday evening. The company characterized the job cuts as "a strategic realignment," designed to ensure it is positioned to succeed for the long term. They were announced to employees Friday in an e-mail from company president and chief operating officer Gwynne Shotwell. The company has a work force of more than 6,000 employees. Laatst gewijzigd door Micele : 12 januari 2019 om 12:32.